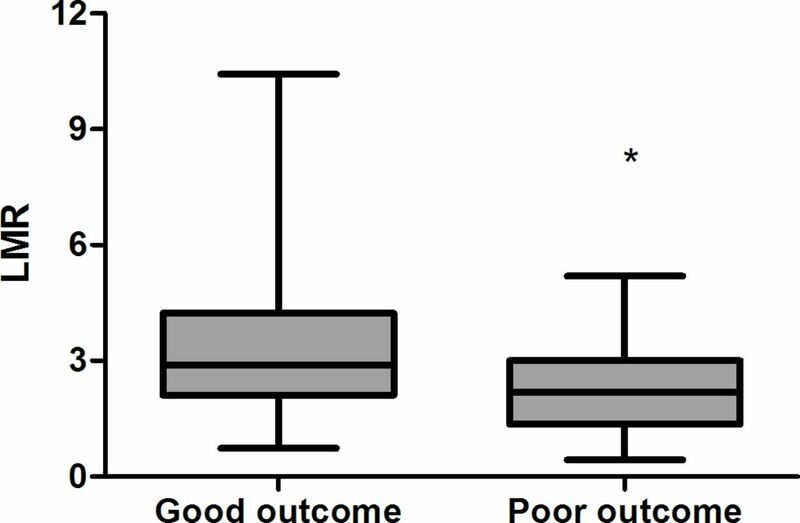 Background Lymphocyte to monocyte ratio (LMR) is associated with functional outcome in patients with stroke. But the relationship between the LMR value and the prognosis of cerebral venous sinus thrombosis (CVST) has not been investigated. Methods CVST patients, admitted to the First Affiliated Hospital of Zhengzhou University, were retrospectively identified from November 2010 to January 2017. Functional outcomes of patients were evaluated with the modified Rankin Scale (mRS). Patients were divided into good (mRS 0–2) and poor (mRS 3–6) outcomes groups. Univariate and multivariate Cox regression analyses were used to assess the relationship between LMR and the poor survival outcome. Results A total of 228 patients were included of which 41 had poor outcomes (18.0%). The duration of follow-up was 22 months (6–66 months). LMR (2.3±1.2 vs 3.2±1.8, p<0.01) was significantly lower in the poor outcome group. Multivariate Cox regression analysis showed that LMR (HR 0.726, 95% CI 0.546 to 0.964, p=0.027) was a independent predictor of poor prognosis. Conclusions LMR may be a predictor of poor prognosis in CVST patients. Cerebral venous sinus thrombosis (CVST) is a rare type of stroke, accounting for 0.5%–1% of all strokes.1 According to previous studies, the incidence of CVST was 3–4 cases per million population,2 but more recent studies have shown that the incidence of CVST is higher than expected and may be as high as 1.32–1.57 per 100 000 person-years.3 4 The clinical presentation and prognostic factors of CVST vary widely. The use of the CVST prognostic score based on the International Study on Cerebral Vein and Dural Sinus Thrombosis (ISCVT) is widely accepted,5 because it accounts for multiple variables including: male gender, coma, malignancy, intracranial haemorrhage, mental status disturbance and thrombosis of the deep venous system. Inflammation plays an important role in the risk of CVST and the inflammation response activated by brain lesion is regarded as a fatal role provoking secondary brain injury.6 Some inflammatory factors, such as platelet to lymphocyte ratio (PLR),7 neutrophil to lymphocyte ratio (NLR),8 C reactive protein (CRP)9 and d-dimer,10 11 have been identified through the study of CVST. In this retrospective study, we aim to analyse the association between LMR admission values and outcomes in patients with CVST. Patients included in this retrospective cohort study were from the database of the Henan CVST Registry in the First Affiliated Hospital of Zhengzhou University (Henan, China). All patients diagnosed with CVST from November 2011 to January 2017 were identified. Inclusion criteria were as follows: (1) meeting the diagnostic criteria for CVST established by the American Heart Association/American Stroke Association in 201121; (2) patients with direct or indirect signs of CVST in the MRI; (3) filling defect or obstruction of cerebral sinus in the magnetic resonance venography, digital subtraction angiography or operation searching; (4) clinical features such as isolated headache, vomiting, visual disturbances, focal neurological deficit, seizure and other typical symptoms and (5) an initial blood sample for laboratory testing 12 hours of admission. Exclusion criteria were as follows: (1) patients with unrelated other serious brain lesions, serious lung disease or heart disease; (2) patients with undesirable follow-up, including refusal or loss to follow-up; (3) patients less than 18 years old and (4) patients without complete clinical data. Clinical data such as age, gender, onset to admission time, potential risk factors, clinical presentation, laboratory and imaging tests were collected. Laboratory samples were routinely collected after 12 hours of fasting on admission to the hospital. The inter-rater reliability for involvement of intracranial venous sinus between two investigators was assessed in some cases. We evaluated the modified Rankin Scale (mRS) to determine the patients’ functional outcomes: mRS 0–2 as good outcomes, mRS 3–6 as poor outcomes and death was defined with mRS score of 6. Follow-up information was recorded by telephone interview. Telephone interviewers were not involved in the registry and were blinded to the baseline data. The overall survival (OS) time was defined as the date of admission to the date of death from any cause or to the last follow-up date. All statistical analyses were performed using SPSS V.19.0 software. Continuous variables were expressed as mean±SD or median which were analysed by independent Student’s t-test or Mann-Whitney U test, as appropriate. Categorical variables were presented as numbers which were analysed using χ2 test or Fisher’s exact test. Survival curves were described by the Kaplan-Meier method and compared with the log-rank test. The association between LMR and the poor survival outcome was explored by using multivariate Cox regression analysis. Two-tailed p values of <0.05 were considered significant. There were 263 patients with confirmed CVST admitted during the study period. We excluded 20 patients because of incomplete clinical data, 10 patients because they were lost to follow-up and 5 patients because they were younger than 18 years old. A total of 228 CVST patients were enrolled into this study. The duration of follow-up was 22 months (6–66 months) and 41 patients were defined as having poor outcomes. The baseline clinical data of two groups are shown in table 1. LMR (2.3±1.2 vs 3.2±1.8, p<0.01) was significantly lower in the poor outcome group as illustrated in figure 1. However, there were no significant differences between the two groups with respect to gender (p=0.505), onset to admission time (p>0.1), malignancy (p=0.143), infection (p=0.854), epilepsy (p=0.635), dyskinesia and sensory disturbance (p=0.414), barylalia (p=0.796), isolated headache (p=0.147) and intracranial hypertension (p=0.656). But older patients were identified more frequently in the poor outcome group than in the good outcome group (41.9±13.8 vs 33.8±12.7, p=0.001). In addition, intracerebral haemorrhage and coma were more common among patients with poor outcomes (p=0.001 and p<0.01). As for laboratory parameters, lymphocyte and d-dimer reached statistical significance (p<0.01 and p=0.001), but not monocyte (p=0.788). Additionally, the thrombosis-affected sinuses were also regarded as risk factors. Straight sinus and deep venous were involved in the poor outcome group (p<0.01 and p=0.019). Comparison of LMR between good outcome and poor outcome in CVST patients (*Statistically significant). CVST, cerebral venous sinus thrombosis; LMR, lymphocyte to monocyte ratio. 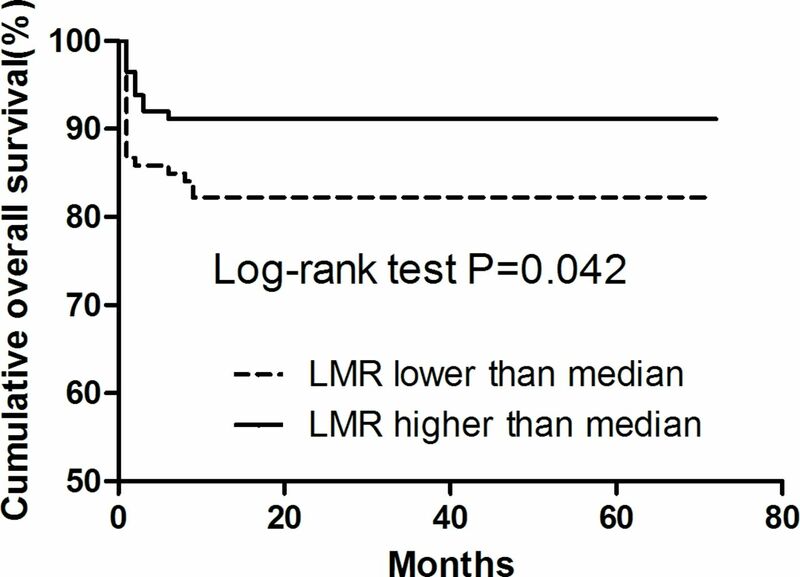 Kaplan-Meier analysis and the log-rank test were used to determine the prognostic significance of LMR. It was observed that patients with high LMR presented significantly higher OS (p=0.042, figure 2) than those with low LMR. Variables in table 2, univariate Cox regression analysis showed that LMR (HR 0.628, 95% CI 0.461 to 0.857, p=0.003), age (HR 1.046, 95% CI 1.020 to 1.072, p<0.001), intracerebral haemorrhage (HR 2.765, 95% CI 1.294 to 5.910, p=0.009), coma (HR 5.059, 95% CI 2.470 to 10.362, p<0.001) and straight sinus (HR 4.249, 95% CI 2.072 to 8.710, p<0.001) contributed significantly to poor OS. Kaplan-Meier survival analysis and log-rank t-test for CVST patients with high/low LMR. CVST, cerebral venous sinus thrombosis; LMR, lymphocyte to monocyte ratio. Based on large ISCVT cohort study5 and the results of our univariate Cox regression analysis, multivariate Cox regression analysis demonstrated that LMR (HR 0.726, 95% CI 0.547 to 0.963, p=0.026) was a predictor of outcome, after adjusting for age, gender, coma, intracerebral haemorrhage, straight sinus (table 3). Our study investigated the association between LMR and the outcomes in CVST patients. The major findings of our study were as follows: (1) lower value of LMR at admission was independently and strongly related to the outcomes of patients with CVST. (2) LMR was also demonstrated as a potential independent predictor of outcomes in patients with CVST. The basis of sinus venous thrombosis can be linked to Virchow’s triad, which includes injury to the vessel walls, a hypercoagulable state and stasis.22 Up to now, recognised predisposing risk factors for thrombosis are known to include inflammation,23 and infection likely adds additional patient risk in addition to the risk of CVST.24 Pathophysiological mechanisms that specifically drive thrombosis during infection have not yet been fully elucidated, but inflammation has been regarded as one of the causes of the hypercoagulable state.25 26 At the same time, inflammation also plays an important role in stroke. It was discovered in an animal model that stroke-induced immunosuppression could result in lymphopenia, shift in Th1/Th2 (helper T cell 1/ helper T cell 2) ratio and monocyte deactivation.27 28 In human studies, lymphopenia and monocyte deactivation were also observed in peripheral blood after stroke, especially during the acute phase of ischaemic stroke.29 30 And LMR, as a new thromboinflammatory marker,15 was relatively more stable than single blood parameters, therefore, it may be more valuable than lymphocyte or monocyte counts alone in the prediction of various diseases including cardiovascular and cerebrovascular diseases and malignancy.15 16 Therefore, we have reason to believe that LMR of peripheral blood and CVST are somehow linked. Research has shown that a lower LMR on admission was independently associated with severe stroke and 3-month poor outcome in patients with acute ischaemic stroke.19 Studies revealed that LMR has been associated with adverse prognosis in multiple malignancies.31 32 To our knowledge, low LMR has been closely correlated with the severity of coronary artery disease and has been regarded as a risk factor for atherosclerosis.17 Similarly, a decreased LMR has been independently linked to long-term mortality in patients with ST-segment elevation myocardial infarction who underwent primary percutaneous coronary intervention.18 Several authors have suggested that LMR might serve as an independent prognostic marker of survival in patients with cancer.33–35 Our data indicated that LMR is a prognostic marker in CVST. CVST can presents as a wide range of neurological signs and symptoms, and has high morbidity and mortality. The prognosis of CVST is difficult to identify due to its complex and non-specific clinical findings. Out of the many prediction models for CVST, the CVST prognostic score based on ISCVST is most commonly accepted. A meta-analysis of several recent prospective series, particularly the large ISCVT cohort,5 found that the long-term predictors of a poor prognosis for all CVST patients, include males, CNS (Central Nervous System) infection, any type of cancer, deep venous system thrombosis, ICH (Intracerebral Hemorrhage), a Glasgow Coma Scale score on admission of less than 9, seizure, age older than 37 years and male gender. One study confirmed this view using the CVST prognostic scored based on ISCVST, contrary to previous models that did not show the value of prediction in the different cohort study.36 In recent years, few studies have investigated the application of PLR and NLR in CVST. And some simple and inexpensive tests, such as d-dimer, CRP, red cell distribution width and mean platelet volume, provided important data regarding the prognosis of CVST. There were several limitations in our study. First, the study was a single centre and selection bias was unavoidable. Additional well-designed and larger prospective cohort multicentre studies are required to evaluate this association. Second, LMR was only collected once, thus, there was a lack of dynamic data. Finally, the exact mechanism of LMR associated with functional outcome could not be confirmed. Further experimental evidence is required to evaluate potential pathways. In summary, our findings suggested that LMR was significantly lower in the poor function outcome group. Lower LMR value may be significantly related to the poor outcome of patients with CVST. We thank YX and BS for being advisers in study design and interpretation. SL and KL for drafting the article. LP, SG, XG and HX for data collection. RZ, YG, HF and XL for data analysis. L-YC for revising the article.
. Cerebral sinus venous thrombosis as a rare complication of primary varicella zoster virus infection. J Assoc Physicians India 2016;64:74–6.
. Cerebral vein and dural sinus thrombosis: clinical features, prognosis and predictive models. Chin J Stroke 2014;7:564–70. SL and KL contributed equally. Contributors SL and KL are joint first authors. YX and BS provided funding and designed the study. LP, SG, XG and HX collected the data. RZ, YG, HF and XL were involved in data cleaning, follow-up and verification. L-YC revised the article. All authors have read and approved the final manuscript. Funding This work was supported by the Science and Technology Department of the Henan Province grant number (No.152102310058), the National Natural Science Foundation of China grant number (No 81530037) and the China Scholarship Council (to KL). Ethics approval All procedures performed in studies involving human participants were in accordance with the ethical standards of the Committee on Publication Ethics (COPE) and the retrospective cohort study was approved by the Ethics Committee of the First Affiliated Hospital of Zhengzhou University.